Company presidents and CEOs steeped in conventional management have proven to be nearly impossible to convert to Lean management. They have decades of experience with a type of business practice rooted in sellers’ market, batch-and-queue processing, complete with dozens of familiar metrics that they know how to manipulate to achieve favorable outcomes. Their mindset and daily practices reflect a “one best way” view of management that thwarts the comprehensive adoption and disciplined application of Lean principles and practices throughout an organization. Senior leaders are consumed by strategic matters such as growth, market share, acquisitions, and the like. 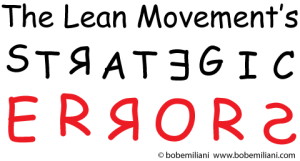 Lean is seen as neither a strategy nor of strategic importance. Their interest in becoming the type of leader necessary to lead a Lean transformation is therefore nil. Despite the harm that batch-and-queue processing does to all stakeholders, most leaders have no interest in changing their beliefs about management and business processes, their behaviors, or competencies. When leaders ask for proof that Lean delivers bottom-line results, we diligently go about finding credible financial data which, when presented to leaders, is ignored. Why? The only path to achieving such performance is by changing one’s beliefs about management and business processes, leadership behaviors, and leadership competencies. We eventually realize that gathering such information is simply a delaying tactic used by top leaders to avoid having to know or do anything different. Yet, we do not give up. We try again, this time showing them live examples of real businesses that have prospered with Lean management. All too often the result of these genba walks is disappointing; seeing is not believing. Remarkably, empiricism fails with executives who claim supreme allegiance to rational thought, data-driven decision-making, and practical matters. In nearly all cases, however, leaders don’t know enough about Lean to know what they are looking at on the genba or its significance. Even a skilled interpreter of the sights and sounds witnessed by executives has little impact. Leaders’ bottom-line focus is based on this simple view: Process Improvement —> Bottom Line Results. The actual relationship is: People —> Process Improvement —> Bottom-Line Results. The leaders of the Lean community have largely failed in efforts to tell the latter story, in part by focusing on Lean tools for nearly three decades instead of kaizen. Diminishing or ignoring the people aspect, as well as the “Respect for People” principle, while concurrently ignoring the unique roles and responsibilities of leadership in Lean transformations, has led to where we are today. Yet, were a much better job done of explicating the people and leadership aspects from the start, most leaders would likely have found Lean management to be unattractive given the personal challenges that they despise and the organizational change problems that they imagine to be insurmountable. Wealth creation via Lean was the wrong challenge for executives because the vision is too narrow and their alternatives to Lean are many. As I have noted in previous writings (see REAL LEAN Volume 3, “Shortcuts to Wealth,” and “Problem-Solving Behind the Front Line“), Lean management competes against a dozen other methods that senior managers can use and re-use time and time again to improve business performance and create wealth. The harsh, but realistic, view is that Lean management is simply non-competitive. It is the hardest method by which to get bottom-line results, and also perceived to be the slowest. The dozen or so other methods used by leaders to improve business performance and create wealth are far easier to apply than Lean, and are seen to yield bottom-line results more quickly. Unwillingness to recognize and confront the common view among senior leaders that the executive class is superior to the working class, and that the working class is the source of nearly all company performance problems. The predictable executive mindset of superiority and of their own flawless execution naturally renders workers as inferior, the sole generator of problems, and the only class in need of continuous improvement tools and methods. Coupled with a failure to recognize how leadership is connected to followership, separation between the classes remains solidly in place, therefore assuring that Fake Lean will prevail over REAL Lean. Failure to learn from the history of Scientific Management, the antecedent to Lean management (see REAL LEAN Volume 2), whose proponents faced exactly the same challenges 100 years ago as Lean advocates face today. The result is that measures taken to gain acceptance are largely identical to those measures taken 100 years ago (see REAL LEAN Volume 3, “Sustaining the Lean Management Movement”). The same methods used to gain acceptance then and now have yielded the same poor result. Failure to learn from the history of Scientific Management, wherein selected tools were eventually absorbed into conventional management practice to facilitate wealth creation in conjunction with the previously established methods (see item 1, above). This could be the fate of Lean management as well. The lack of recognition of items 1-4, above, led to the failure of the leading Lean organizations and key individuals to work together as a team in order to advance shared interests and, more importantly, gain wider acceptance for Lean management among business leaders for the benefit of all stakeholders. This lack of teamwork must be corrected in the future. From the start, Lean management should have been seen as a new product entering a crowded marketplace with numerous, well-established, simple solutions judged by its users to be highly effective based on their widespread application across all industries over 125-plus years. This suggests the need for a new go-to-market strategy, one that is fundamentally different than the one that was actually employed – wealth creation. A strategy of resource conservation, following in Toyota’s wise footsteps, is most sensible. Circumstances are changing, and along with that there will emerge a new focus among the majority of business leaders. At some point, perhaps soon, they can no longer support the resource-intensive, sellers’ market (supply-driven) batch-and-queue production method that results in large and costly mismatches between supply and demand. Business leaders will be forced to accept reality and adopt the resource-conserving, buyers’ market (demand-driven) flow production method. And, they will have no choice but to learn Lean management – especially kaizen – in order to lead this critically important transition in human activity. The future will almost surely be one in which resources of all types must be conserved, except for human creativity, ideas, and innovation. Energy consumption must be reduced, water consumption must be reduced, materials must be more sparingly consumed, and supply lines must be shortened, while at the same time assuring economic vitality for the benefit of business and humanity, and the preservation of Earth. This is the new go-to-market strategy. Executives have few, perhaps even no other options. The need for wealth creation will not disappear, and will be achieved in large part by the vast savings generated over time through resource conservation. Lean management’s time has yet to come. When it does, it will be seen as a great management innovation, become more widely embraced, and evolve in ways that help humanity survive its many challenges in the long run. Read the next blog post “Something Revolutionary Seen as Ordinary” for further discussion about the presentation of Lean to executives as a means for wealth creation. Straight on. Fantastic analysis. But who is listening? Why don’t we Lean leaders who get that Lean, to use an old-fashioned analogy, is simply ‘Good Stewardship’ start over in our own green-fields and lead by example (potential arrogance aside; doing it closer-to-right from the outset)…? Let’s go around the ‘established wall’ rather than going through it. I propose a symposium to decide which industries and products to start with and bring potential sources of funding together to support our efforts. Let’s make both our local regions economically sound as well as our corresponding states, nations and ultimately Earth as you suggest; in the process all of humanity wins! Why not shoot for the stars? I’m listening, and learning! When I become a leader that can harness/protect my fellow co-workers creativity to better improve a product or service in a timely manner that eliminates the top management’s concerns with bottom line results…..my LEAN journey will began! But I still enjoy learning from conventional management techniques to understand how it was used before and is still practiced now only so that I won’t repeat what history has already taught me.